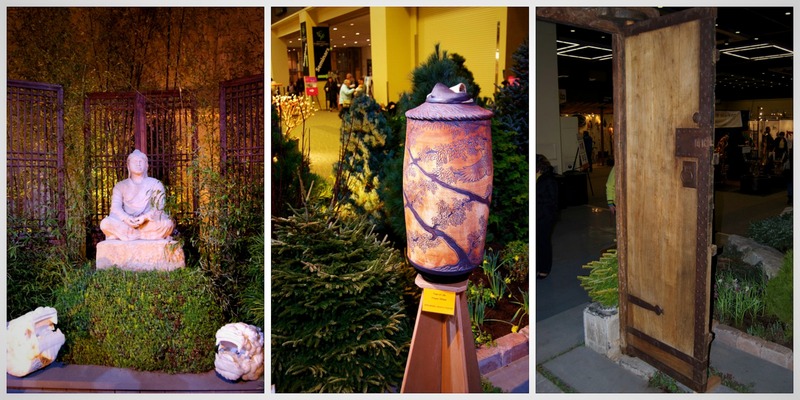 If you read my last post you know I attended the Northwest Flower and Garden Show in Seattle. One thing I love about this show is that the Washington convention Center is located in the heart of downtown Seattle, so if you’ve absorbed enough from the garden world, you can head out for a bite to eat at a fabulous restaurant, do some site seeing or shop to your heart’s content. Everything is just a few steps away. “The Art of Retreat – Two Generations Define Their Own Garden Studios” by (mom) Sue Goetz and (daughter) Courtney Goetz. I absolutely love the color of this studio! Glad the two generations could agree on it! The shots from this side (above) of the retreat reflects the mother’s preferences while the shots from the other side (below) show some of the daughter’s likes. The Chartreuse green plant material shines brightly against the plum color of the studio and the sliding door is a knockout feature of the structure. The use of iron around the garden was a hit with me as well, even the old box springs that are being used as an architectural element and a tool rack. 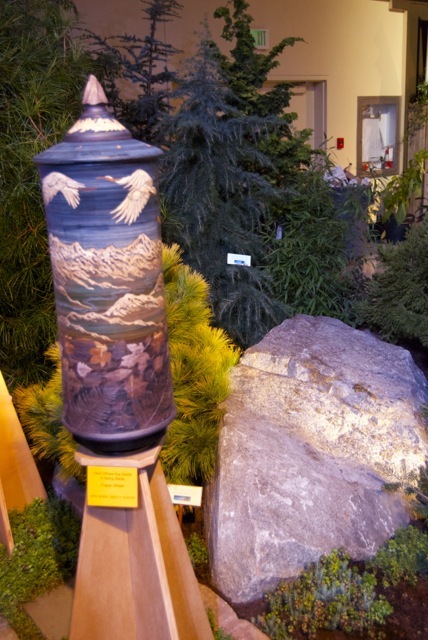 The Garden of Artful Delights, a collaboration between the Arboretum Foundation and Museum of Glass, as a tribute to the artist Ginny Ruffner was a definite eye-catcher! 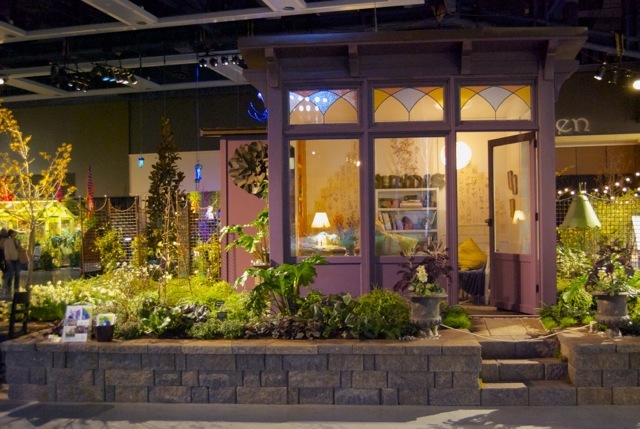 This garden, I found out later, is a recreation of Ruffner’s real Seattle garden. The color incorporated into this space was really beautiful and the intermixing of so much glass was interesting as well. 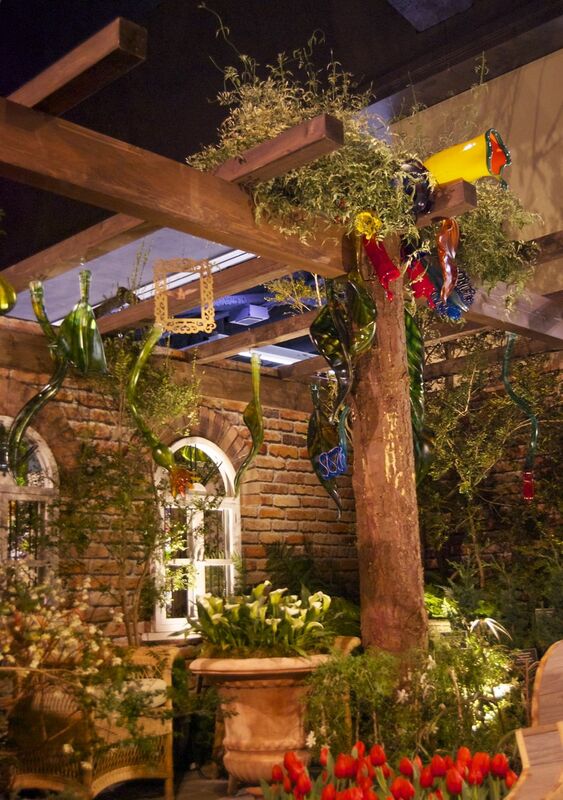 I feel this garden definitely provided some ideas about how to get started adding glass into the garden. 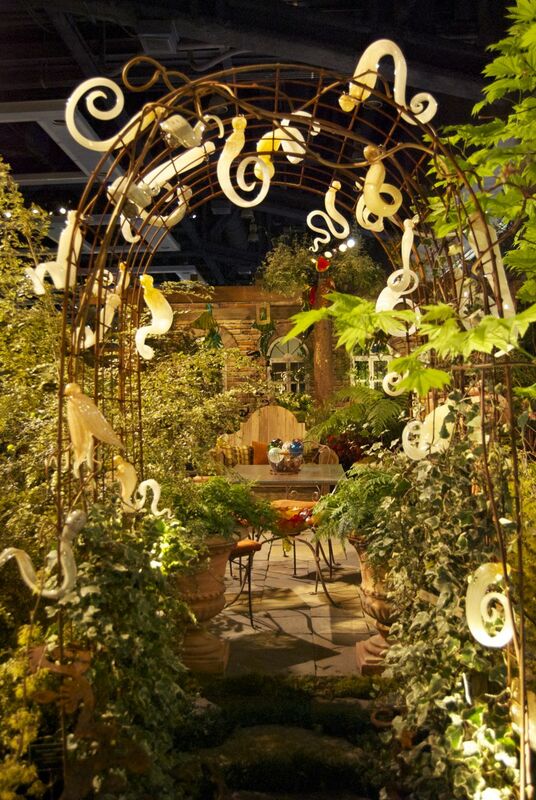 My favorite piece is the iron arbor with the “squiggles” all over it. 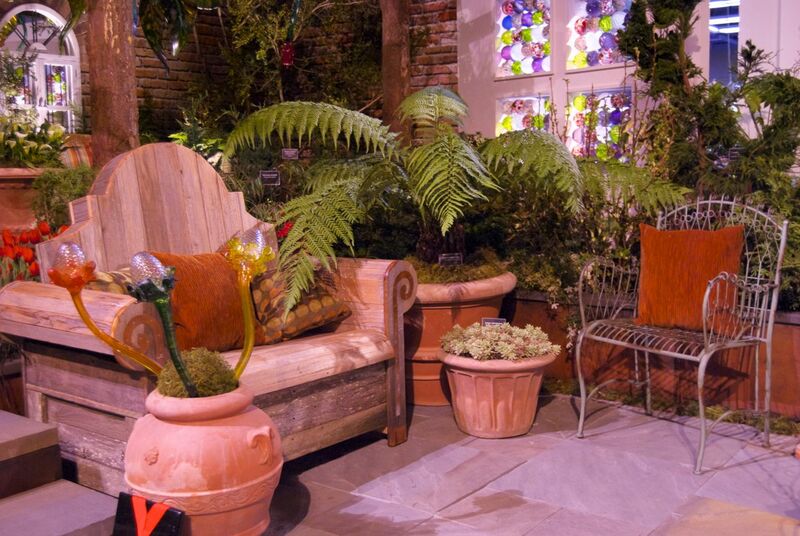 But also notice how easy it is to add glass elements to pots or seating areas. There were so many gorgeous display gardens at the show but I simply can’t do them justice here. Instead, I hope this short viewing provides some inspiration to take in a Flower and Garden Show in your local area. These shows are really a fun experience and undoubtedly you will learn something new. 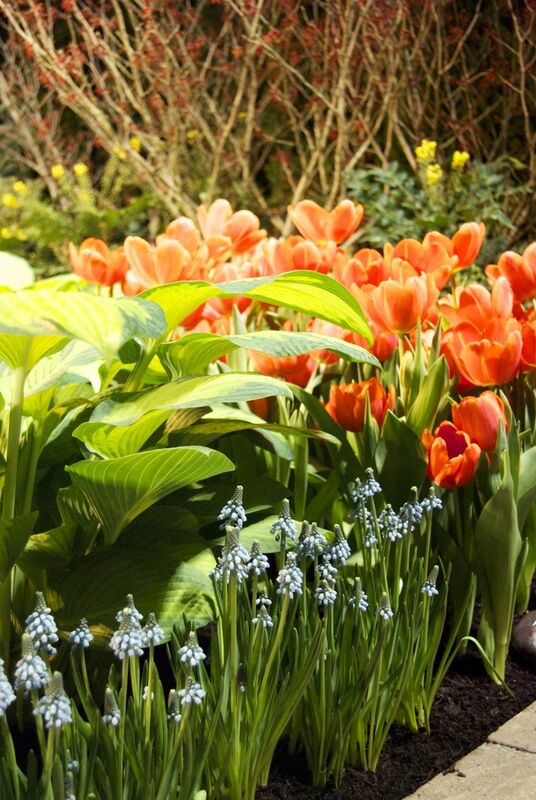 For local readers, the Boise Flower and Garden Show is being held March 21-23 at the Boise Centre. Don’t miss the wonderful vendors and the teaching seminars! In fact, yours truly will be speaking! Happy Almost Spring! The shows always have a lot of creativity and ideas. Loads of color too. Some very interesting displays…I hope to see this show one day. Andrea – thanks for this fun post. I came back today so I could soak it up a bit more – and I wish I could come to hear you speak at the Boise Center – but maybe some other year! LOL. 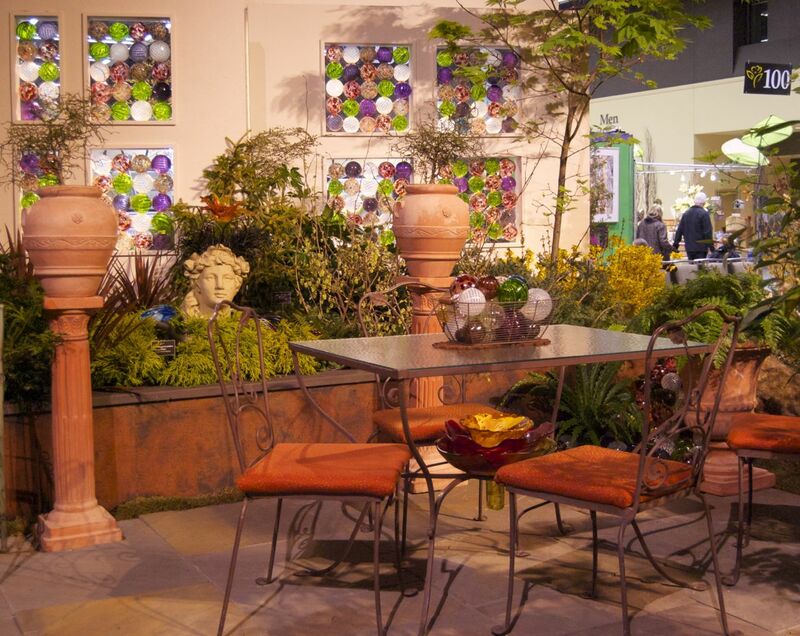 I have never been to a garden show and your encouragement to check one out has made me think about going to one this year. 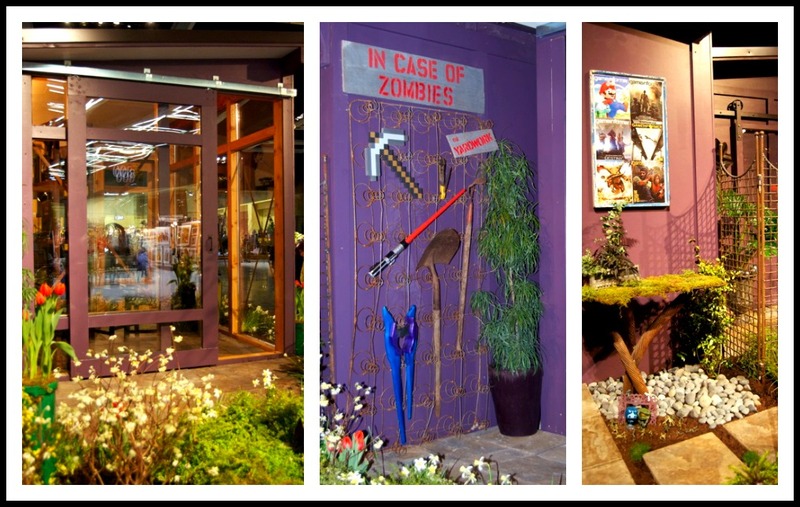 I was at a mall one time – (helping a friend close up shop) and it was the day before a garden show – and so folks were there setting up for the garden show and I was amazed at how much work goes into EACH display. Also amazed at how “nice” the folks were – which confirmed for me that gardeners are truly some of the most contented people I know (stereotype I know, but I really mean that). also in this post, I enjoyed seeing the glass art and I look forward to learning more about Ginny Ruffner…. Lastly, thanks for showing us the two generations working together (loved it) – and the shots of their different views was awesome. Okay, I enjoyed more – but oh my goodness, the bed springs were so creative!@#! not necessarily “my” thing, but so fun to see how people recycle. Have a great week and hope the upcoming show – and your speaking – goes well.